Many of us prefer Android over iOS as our smartphone operating system. But at the same time, even most Android users would agree that the one stop sync and backup solution offered by iTunes for iOS devices is simpler and more user friendly than Android’s way of copying files directly into the file system. Officially, Android does not have a PC Suite like desktop sync utility similar to iTunes (for iPhone, iPad and iPod Touch) or Nokia Suite (for Nokia phones). However, thanks to some third party vendors, there are some decent applications that help you manage your Android device from your computer. There are a lot of desktop management applications for Android devices but very few which offer complete management solutions. To manage your phone from your computer, you need to access your phone contents through it. To do this, you must enable USB debugging mode that allows you to make changes to your Android phone. To do the same in your Android 4.0.x and higher devices, go to Settings >> Developer Options >> Check on USB Debugging. For Android 2.x or 3.x devices, go to Settings >> Applications >> Development >> USB Debugging. Note: If you don’t see the Developer Options under the settings menu of your JellyBean Device, you probably need to unlock the developer mode. To do this, go to Settings >> About Phone >> Tap repeatedly on the Build Number at the bottom of the list. On the third tap, you will be notified that you have four more taps to “become a developer”. Continue tapping till seven times after which the developer mode is unlocked. Developer Options will now be accessible under Settings menu. If you are ready to spare some bucks for an Android management application, Wondershare MobileGo lets you to manage everything in your Android phone from your computer. In fact, MobileGo has something for every Android user. You can back up your data and fully restore them later; manage your music collection and transfer files to and from your computer; download apps and install them on your device; manage contacts and SMS and sync contacts with Outlook and send messages directly from your computer. MobileGo also lets you to move apps to the SD card, or export your apps for installation in other devices. Support for websites like Hulu, YouTube and Google Play. This is another decent desktop application that lets you to manage your Android device from your computer. SnapPea is available for free and lets you to back up your contacts, messages and photos to your computer. After installing SnapPea on your computer, when an Android device is connected via USB, SnapPea will try to identify your device and install the SnapPea mobile app. For this step, make sure USB Debugging is turned on in your Android Device. Apps: The Apps list shows all the installed (User as well as System) apps on your device. You can also install apps from external apk files on your computer, uninstall apps from your device, move them toSD card, or export them to your computer as apk. Contacts: The Contacts list lets you to add, merge or delete contacts from your phone. You can also import or export contacts from your device to your computer and vice versa. Messages: Lets you to manage SMS and MMS messages on your phone. You can send SMS and MMS messages from your computer using your phone. There is also an option to import old messages from earlier backup or file; or to export all messages to the computer. Music: Add music tracks to your Android device from your computer or export tracks from your device. SnapPea supports iTunes playlists too; so you can directly import them to on your device. Pictures and Videos: Similar to importing music, pictures and videos can also be imported to an Android device from your computer using SnapPea. 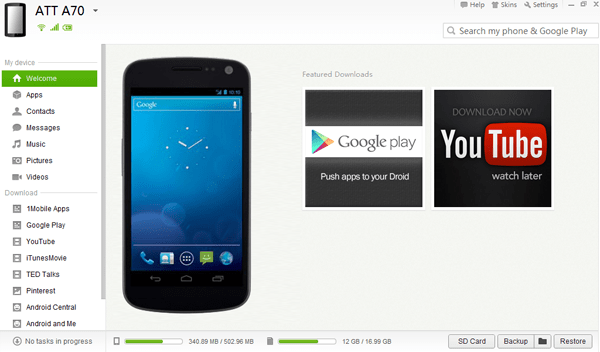 Downloads: SnapPea lets you to browse popular app stores for Android and download apps to your device directly. It is actually a frame based web browser with predefined bookmarks for the store URLs. SnapPea can also connect to your Android over Wi-Fi. Control your Android device from your favorite web browser on Computer. AirDroid communicates to your phone over Wi-Fi. Additionally, the AirDroid mobile app should be installed on your device and your computer and your device should be connected to the same Wi-Fi network. AirDroid is cross platform and so you need not worry about the preferable operating system (computer). All you require is a modern web browser like Firefox or Chrome to make things work. 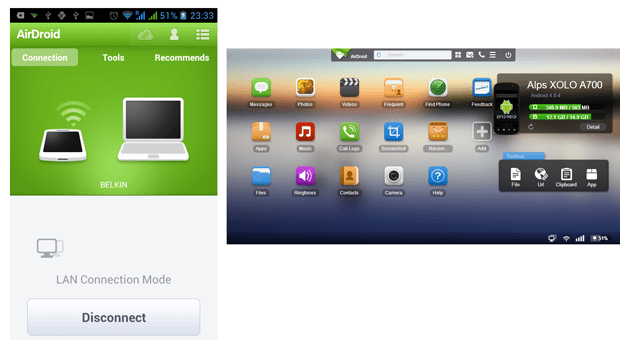 After you download and install AirDroid, open the app on your device. To connect your Android device to your computer, navigate to this [https://web.airdroid.com] page and enter the passcode displayed on the Android app (device). Alternatively, you can scan the QR code shown on the computer screen by tapping on the camera icon in the mobile app. Keep track of your messages (SMS and MMS). Manage Photos and Videos on your device and upload them from computer to your Android device; or download them to your computer. Install, uninstall, download (backup) and restore apps from/to your Android device. Keep track of your call logs from your computer. File Browser to browse files in your device. Preview, edit and set ringtones for calls. Version 2 of AirDroid is currently in Beta. It includes some more features such as tracking your device’s location, screenshot capture, requires root, and many more such enhancements.